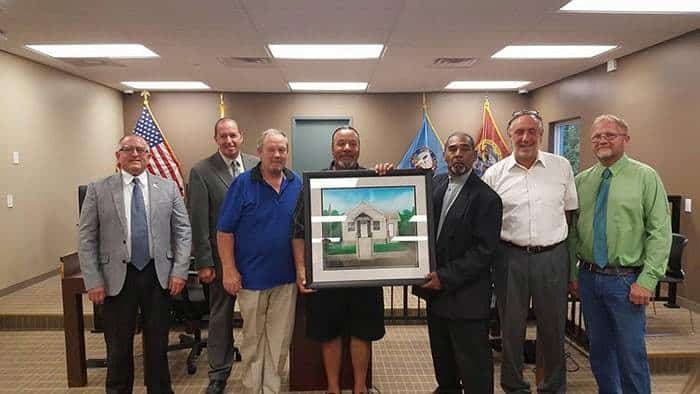 SOUTH TOMS RIVER – During a recent South Toms River council meeting, Vernon V. Willis painted and donated his rendition of the first South Toms River Borough Hall. A dedication will be hung with the painting, which recognizes that the first municipal building was located at 9 Bushwick Avenue, which is now known as Center Street. On May 19, 1930 the first meeting was held at the original Borough Hall under a governing body of Mayor Hortie G. Flint and council members Frank W. Applegate, Charles N. Warner, A.P. Greim, Arthur Cornelius, Charles Feeney and Charles Nordstrom.